Yemeni Houthi rebels have fired several missiles into Saudi Arabia over the past two days, Iranian and Arab media reported. According to Tasnim News Agency, an outlet affiliated with Iran’s Revolutionary Guards, the Houthis fired a missile dubbed “Badr-1” at the Saudi border city of Najran on Friday. Quoting Houthi rebel sources, Tasnim said the target was a gathering of Saudi military forces in the border region. The Saudi Royal Air Defense Force said it successfully intercepted the missiles coming from Houthi-held region in Yemen toward Najran. The Saudi-led coalition fighting in Yemen criticized Houthis for deliberately targeting civilian and populated areas, but said there were no casualties. Coalition spokesperson Turki al-Maliki held Iran responsible for the spike in Houthi missile attacks into the kingdom. “This hostile act carried out by the Iranian Houthi militia proves that the Iranian regime is still providing the terrorist Houthi armed militia with qualitative capabilities, in flagrant defiance of UN Security Council Resolution 2216 and 2231, with the main objective of threatening Saudi Arabian, regional and international security,” he said. On Thursday, Saudi military forces also intercepted a ballistic missile targeting the border province of Jazan. And the White House today released a statement expressing alarm over a Houthi missile attack against a Turkish cargo ship 70 miles off the coast of Yemen that was carrying wheat to Yemen’s Saleef port near Hudaydah. “We deplore the Islamic Revolutionary Guard Corps’ diversion of the Iranian people’s wealth to exacerbate conflicts in other countries and threaten international commerce,” the statement said, reiterating previous assertions that Tehran supplies the Houthis with ballistic missile technology. Comment: The Houthi missile attacks against Saudi civilian and military targets have recently increased in both frequency and range. The latest spike of missiles into the kingdom has heightened tension between Tehran and Riyadh and risks igniting a major conflict between the two regional rivals. Saudi Arabia and its allies blame Iran for the attacks, accusing Tehran of providing ballistic missiles and other weapons to the Houthis. The Houthis have rencelty also attacked a Saudi oil tanker in the Red Sea. The coalition spokesperson described it as a “terrorist attack” aimed at disrupting commercial shipping lines in the Bab al-Mandeb strait, and reiterated that Tehran was arming the Yemeni insurgents. Since the Yemeni war began in 2015, the Houthis have fired about 100 missiles against civilian and military targets inside Saudi Arabia. Tehran denies providing weapons and missiles to the Houthis. But UN fact-finding teams and US and allied militaries have established connections between Tehran and Houthis’ growing missile capability. Iran is also said be behind the Houthis’ enhanced drone technology. The rebels last year said they possessed Qasef-1 and three other drones types used for intelligence and attack. According to the UK-based Conflict Armament Research group (CAR), the Qasef-1 drone was most likely made in Iran and smuggled to the Houthis in parts. 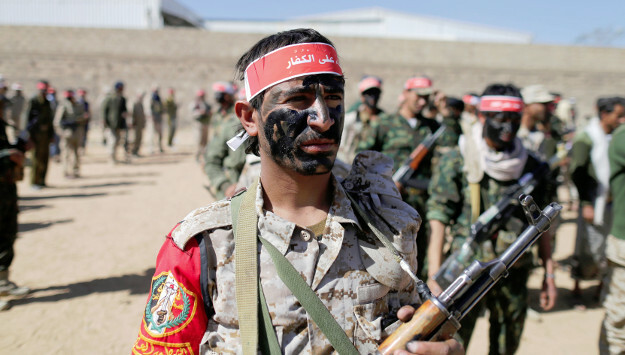 Tehran's support for the Houthi rebels in Yemen has also further strained Tehran’s relations with Washington. When Secretary of State Mike Pompeo laid out a new Iran strategy on Monday, it was one of his key demands that Tehran end its support for the Houthis in Yemen. Saudi Arabia and its allies have been at war in Yemen since 2015, launching air raids and laying a blockade on the Houthi-controlled regions in Yemen. The war has claimed the lives of more than 10,000 Yemenis and caused a humanitarian crisis in the country. International efforts to find a negotiated settlement to the war have yielded no results so far.